caring for the soil and celebrating cultural diversity. In the state of Assam in the remote northeast corner of India, there is still little support available to growers interested in traditional organic farming. 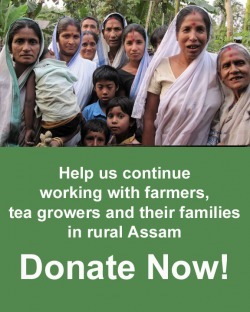 Our projects provide technical support and encouragement to farmers, tea growers, students and families throughout Assam. We work with NGO's, agricultural extension staff, teachers and others interested in promoting more sustainable agricultural practices. An important element of our work is sharing ideas and information about Canadian and Assamese culture, and creating opportunities for work and study exchanges. Interested? Contact us for information about how you can get involved with Fertile Ground. Read about the experiences of some of our volunteers here! Thanks to everyone who helped out at our resource centre in Assam in 2009/2010! CLICK HERE to meet some of the people and initiatives your donation will support!